LowRider Dachshund Rescue is a 501(c)(3) Non Profit Organization. All donations are tax-deductible for federal income tax purposes. Documentation can be provided upon request. We are funded 100% by our volunteers and the generosity of donors. Make a one time Paypal donation! Please consider making a one time donation via Paypal. A Paypal account is not required but if you do have an account you will be prompted to log-in. Some doxies only need one or two of these services, some need them all. Please consider donating a needed vet expense. Want to donate toys, food, treats, or cleaning supplies? Check out our Amazon wish list. We update our list monthly with items needed for our fosters and our adoptable doxies! Any bit helps. 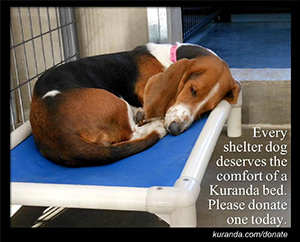 We are always needing Kuranda Beds for our foster homes.The raised design of these beds gives the dog a soft and dry place to relax off floor. The sturdy frame and solid vinyl fabric is non porous making it easy to sanitize with bleach or disinfectant! Click below to donate a bed! If you prefer to donate via mail, here is our mailing address! Monetary donations are always appreciated and needed. 100% of your donation goes directly to the medical and daily care needs of the dachshunds in our rescue. As an all volunteer organization, we have no paid employees. We rely on a network of foster families to care for our dogs until they are adopted.